Seeing the farmhouse, getting to hold some of the artifacts unearthed that day – a metal button, a shard of blue and white pottery, and a small clay sphere that we theorized might have been a marble – made me think about this project and what we can uncover. I’m used to engaging with the past through words on a page. The archives always feel a little bit magical to me: these texts still exist centuries later, and I get to touch them, smell them, read them. I felt a similar tug at the dig, seeing artifacts being unearthed and thinking about our access to the past through what happens to have been left behind. At a basic level, archaeological investigation and archival literary research give us physical access to fragments of past lives, preserved deliberately or accidentally. You figure out where to look, but you don’t always know what you’re going to find. This project is one of reconstruction from a distance and with pieces missing: the recipes are vestiges of what did get recorded, leaving little behind of what didn’t. Cooking from the archives creates a powerful bridge between me and the past. I will never stand in a kitchen without refrigeration, without even the possibility of electric lights, without having spent my whole baking life reaching automatically for ingredients like vanilla extract and uniform sticks of butter, but I can still approximate how Naples biscuits would have tasted nearly three hundred years ago. There’s always a gap, though, related to how just far that bridge can reach. Working on this project has brought me up short at this gap time and again: reading handwritten manuscripts begs to know more about the person who wrote them, but there’s often little headway to be made. We can decipher handwriting, but identities are harder. This impulse isn’t just personal – it’s a question that comes up often for me and Marissa, of who wrote these recipes down, of what we know about them. Usually, not much. But this recipe left a faint trace of one of the individuals behind it. This Herb Soop comes from UPenn MS Codex 1038, home to some of my favorites, like the Maccarony Cheese and Desart Cakes. The volume contains at least three separate hands, and we still don’t know anything about these writers. This handwriting is the second in the volume, probably written down sometime in the 1790s or early 1800s. 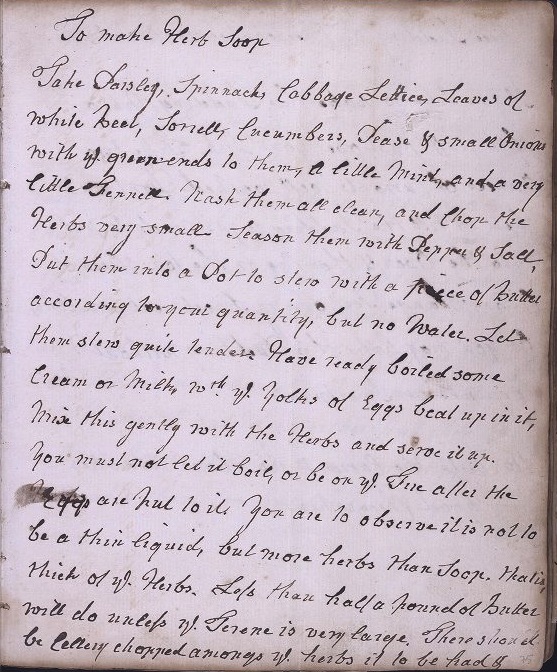 The end of the recipe attributes it to “Lady Laroche.” (She is probably the source and not the writer of this recipe, since several subsequent recipes in the same handwriting are attributed to other women.) It is nearly impossible to know anything about the other women whose names accompany their recipes – the Mrs. Baker who gave the writer her recipe for Curd Cheescakes, the Mrs. Fordham who told her how “To make Flumery,” or the Mrs. Turner who showed how “To Dress a real Turtle as the[y] do in the West Indies,” for instance. “Lady,” however, provides direction in a way that “Mrs.” often cannot. It turns out that this “Lady Laroche” can be one of only two women. James Laroche, a Bristol politician and slave-trader, was created baronet in August 1776. Since the baronetcy became extinct when he died in 1804 without any male heirs, this Lady Laroche has to have been one of his two wives. The first Lady Laroche was born Elizabeth-Rachel-Anne Yeamans in Antigua. An heiress (she brought at least one plantation to the marriage) and widow, she married James Laroche in 1764 and moved to England with him. After Elizabeth-Rachel-Anne died in 1781, James remarried; his second wife may also have been named Elizabeth. We know nothing else of her except that she survived her husband and died in Wales in 1824. Can we know how or even if this recipe writer and either Lady Laroche knew each other? What else they might have talked about, why this particular recipe was the one shared? No. But sometimes, even this small glimpse into archival identities feels like uncovering something satisfying. Mix this gently with the Herbs and serve it up. other herbs you like but not strong of any one in particular. Some leave out the Fennell, as it is apt to be too strong. In a medium saucepan, combine all ingredients except for the milk and egg yolk. Cook them over low-medium heat, stirring often enough to prevent the greens from sticking. Cook until the greens are all wilted and the cucumbers are translucent; for me, this took about 20 minutes. (Though you could probably let them “stew” even longer.) Heat the milk in the microwave or on the stove until quite hot. In a small bowl, whisk the egg and then, still whisking, add the hot milk in a steady stream. Remove the herb mixture from the heat and stir in the milk. Serve immediately. 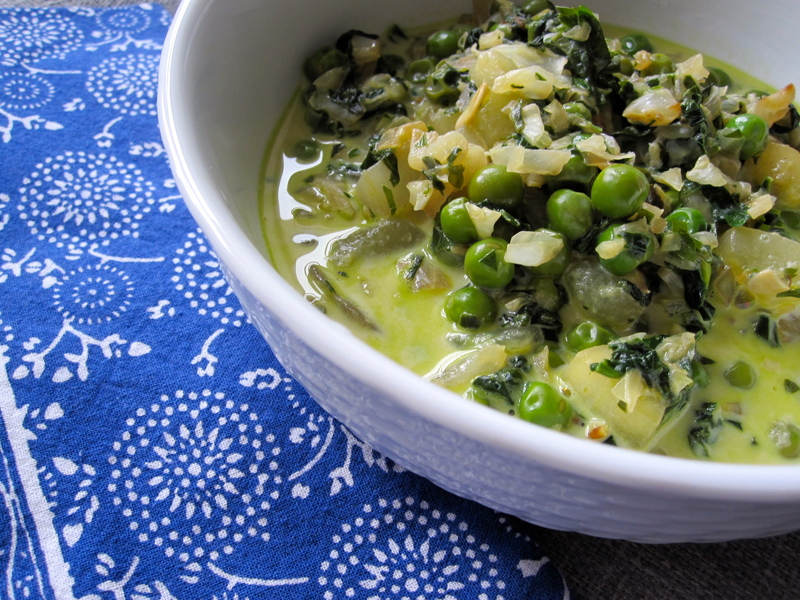 The Soop tasted green: stewed together, the herbs and vegetables made a pleasantly flavorful whole. I’d never had cooked cucumbers before and was curious – they softened but held their shape, rather like zucchini, and provided nice texture in the soup. I liked the zip from the scallions and the chewiness of the cabbage (even if cooking it did make my kitchen rather … fragrant). In its piling together of many different herbs and vegetables, the Herb Soop felt like a precursor to some of Yotam Ottolenghi’s recipes. I found it satisfying that what I was tasting was probably pretty close to some of the results this recipe would have yielded for eighteenth-century cooks: all of the ingredients remain available, the cooking technique was easily duplicated in my kitchen (albeit with the ease of a gas stove), and the methodology was specific enough that I could follow the recipe’s instructions closely. In fact, this Herb Soop recipe is quite detailed in its ingredient list and instructions – it’s very helpful to know, for instance, that the end result should be “more herbs than Soop” – more so than many of the other recipes we’ve engaged with, like Artificial Potatoes. But it provides few precise measurements. I guessed at these proportions, determining them largely based on what I had and what I liked. (I don’t love fennel, so I’m one of those “some” the recipe mentions who “leave [it] out.” And my little produce market doesn’t carry sorrel, so I didn’t use it.) And I imagine that’s what early cooks did as well, making the soup slightly differently each time based on what needed to be used or what was available. What else could you toss in here? Leeks, zucchini, basil, cilantro, green bell peppers – really, anything green that happens to be lurking in your crisper could make its way into this soup. Some hot pepper flakes would liven things up. I see the appeal behind the milk-and-egg liquid choice: it’s a rich addition and adds some depth to the greens. However, I might substitute some vegetable broth or chicken stock for a lighter soup. Basically, this recipe provides a wonderful alternative idea for using up the leftover greens that I normally toss into a grain salad, a stir-fry, or baked eggs. Love the gorgeous writing in this post—the soup looks not half bad either! I’ve always wondered, is the European cucumber (which is a little more zucchini-like) older or newer than the American cukes we use over here? Also, now I want to grow sorrel. Common or French sorrel is one of the easiest garden ‘herbs’ to grow; coming back heartily year after year in the garden without any fuss; it would add a refreshing lemony punch of flavor. I can imagine when I make this recipe I’d add a small grating of nutmeg. I made this tonight as part of a four course dinner for my hubby and son. Of course, I served the ‘soop’ first 🙂 It was very good and tasty. I added a few sprigs of lovage herb and dill. Your blog is priceless. Love all the variety’s of food on your blog. This soop still looks kind of interesting to me. Will have to try it. Does this serve more than one? Since there’s no stock or broth (just the milk) it doesn’t look like it makes very much. You mentioned you prepared it as one course for dinner for 3, so I’m assuming that was fairly small half-cup servings maybe? Unlikely that they would leave sorrel out of the recipe…they’d just go out to their herb garden or garden and harvest some. Short of that, they’d go forage it in the nearby woods or pastures.